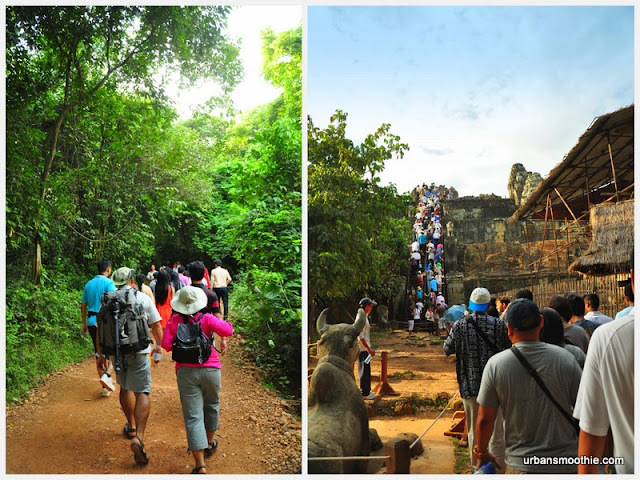 On this evening, we head to Angkor Archaelogical Park entrance to purchase our one day entry pass for USD$20 per person. The purchase of tickets after 4.30pm daily will entitle us for a free entry to watch the sunset at Bakheng Hill for free during this evening and the tickets will be valid for the entire day tomorrow. The hike up the Bakheng Hill is much easier now with the new wooden staircase installed. We reached the top with breeze in five minutes to spare. You don't need to be in top athletic condition to conquer it. Initially, we planned to visit all of Angkor Archaeological Park's temple (only the famous ones) including watching both sunrise and sunset tomorrow, because I heard the climb up and down of Bakheng Hill during the evening is awfully difficult. However, after some persuasion by the tuk-tuk driver Mr Dara, we decided to watch the sunset today, so we can have a less hectic day tomorrow. And we're glad we made that choice. Mr Dara came to pick us at 4.30pm and he brought us to the Angkor Archaeological Park entrance to purchase our tickets. There are separate booths for 1 day, 3 days and 7 days pass. We queued up at the one day pass booth (because we are not archaeologist that can stare at the same stones for an extended period of time), paid USD$20 per person and got our pretty faces snapped by the camera. Say 'cheese'. The tickets that we buy at this time was stamped for tomorrow's date, but we can get free entry to watch the sunset after 5pm. 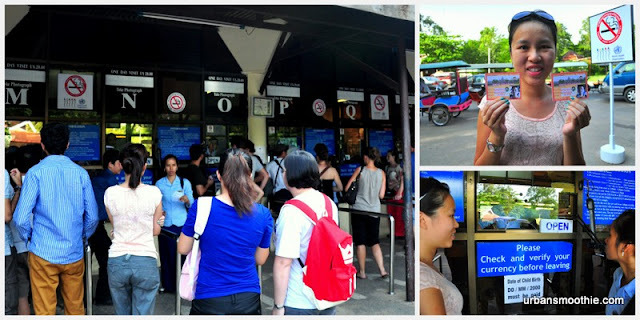 After purchasing the tickets, we hopped on our tuk-tuk and continue to drive into the park. We passed by Angkor and the crowd were huge there. After about 10 minutes, we reached the foot of Phnom Bakheng Hill. Our driver dropped us off and told us he will park at the tuk-tuk parking area to wait for us. The hike up the Bakheng Hill took me about 10 minutes and the slope was manageable. Some women even wore platform heels, which require an honourable salute. When I finally reach a flat surface and saw the Phnom Bakheng Hill new staircase, I breath a sigh of relief. Hurray! According to my survey in the blogosphere, in 2011, visitors still had to climb the awfully steep staircase up the hill that was deemed dangerous. So, to those of you who worried about the steep staircase, you no longer have to. We went up in a breeze. Thanks to the fact that the authority now need to maintain a maximum of 300 visitors on the top each time, there were plenty of space for us to stand or seat. By the time I settled down on a location with the best vantage point, we still have another hour to go before the sunset. Worry not that you might get bored, there were many visitors around to keep you entertain. I came across a park ranger that kept warning people from standing erect on the staircase or seating too near the ledge every five minutes. A young white man with short curl hair got reprimanded for attempting to smoke. Shame on you. A group of Cantonese speaking Chinese debating where is the best resting spot. There were also some couples in passionate embraced. The sun finally set approximately around 6.30pm. There were clouds all around and some crowd gave up waiting and decided to head down the hill. More spaces for me and our tripod now. I'm glad we waited it out because we manage to set the orange yolk and the end. However, if you ask me whether is this the sunset not to be miss, I would say no. You can enjoy this similar sunset and any other place that is less crowded.